After a holiday hiatus, we are back in the ice cream making business. Well actually, it's not really a business, and in fact, it's not really ice cream, either. Our latest creation is a dangerously delicious almond milk cremolata, which is a frozen custard that uses almond milk instead of cream as its base. We were first introduced to the concept of cremolata during dinner at Oleana, which I can confidently say is one of Cambridge's best restaurants. Even though a cremolata is of Italian origin, the food is Mediterranean, with a heavy Turkish influence. To be fair, it wasn't exactly love at first sight between me and the cremolata. I liked it, but the flavor was a bit too subtle for me. In any case, we thought it might be an interesting challenge to recreate it at home. So, after a few months of procrastination, out came the ice cream maker and a quart of unsweetened almond milk, and a new recipe was born. Coincidentally, Sortun's recipe for her cremolata is available online, but it seemed unnecessarily laborious - homemade almond milk! We opted for a store-bought version, and several scoops later, I'm not complaining. The only ingredients in her cremolata are almond milk and a smidge of sugar (hence the blandness), so I made some tweaks and additions to get a more robust flavor (see below). 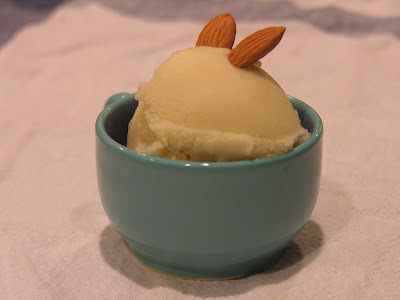 The almond milk custard is simple to make, and it freezes to a delightfully custardy texture in the ice cream maker. Plus, it's low-fat. Even though I made this cremolata with an egg yolk, it could easily be omitted (perhaps in favor of more cornstarch) to make an unusually good vegan dessert. I'm trying to think of some more tips and tricks for this, but it is pretty close to perfection just as is, perhaps with an almond biscotti or cookie on the side. If you have an ice cream maker, definitely make this. If not, buy one, and then make this. It's that good. Mix 1/4 c. almond milk with corn starch and whisk until thoroughly combined. Heat remaining (2 1/4 c.) almond milk and sugar over low heat, stirring until sugar is dissolved. Once mixture is hot, add a bit of the liquid to the egg yolk, whisking vigorously so that it doesn't scramble (this is called tempering). Add the egg yolk mixture to the almond milk, continuing to whisk to avoid scrambling. Add cornstarch mixture, salt, and extracts, and continue stirring until mixture thickens slightly. Remove from heat, allow to cool, and refrigerate for several hours or overnight. Before freezing in an ice cream maker, strain custard through a fine-meshed sieve to get rid of any rogue lumps. It is best served right after churning, but freezes well, too.